Hi there! Remember me? I’m the one that used to bake all kinds of fat and calorie filled desserts and force my coworkers to taste them at 8:00 a.m., before they even got their first cup of coffee of the day. Yeah, about that. I’m trying to lose weight. And I have no coworkers because I’m currently unemployed. And well, that combination makes it hard to make decadent desserts every week, because there’s no one to force feed two dozen brownies to on a regular basis. And I have no willpower, so keeping them in the house is out of the question. Duh. Enter these brownies. They are chocolaty. And rich. And fudgy. But the best part? Around 100 calories and 3 grams of fat. And let me tell you, a little goes a long way. One of these brownies and I’m happy. OK fine, I ate the corner of a second one and immediately put the rest in the freezer. Remember that willpower thing I mentioned before? Still don’t have it. Position rack in center of oven; preheat to 350°F. Line an 8-inch-square baking pan with foil, letting it overhang on two opposing sides (I used parchment). Coat with cooking spray. Sift flour, confectioners’ sugar and cocoa together into a small bowl. Combine the 3 ounces coarsely chopped chocolate and oil in a heavy medium saucepan; place over the lowest heat, stirring, until just melted and smooth, being very careful the chocolate does not overheat. Remove from the heat and stir in granulated sugar, corn syrup mixture, vanilla and salt until the sugar dissolves. Vigorously stir in egg until smoothly incorporated. Gently stir in the dry ingredients. Fold in the walnuts (if using) and the remaining 2 1/2 ounces chopped chocolate just until well blended. Turn out the batter into the pan, spreading evenly. Bake the brownies until almost firm in the center and a toothpick inserted comes out with some moist batter clinging to it, 20 to 24 minutes. Let cool completely on a wire rack, about 2 1/2 hours (hahaha, that’s funny). Using the overhanging foil as handles, carefully lift the brownie slab from the pan. Peel the foil from the bottom; set the slab right-side up on a cutting board. Using a large, sharp knife, trim off any dry edges. Mark and then cut the slab crosswise into fifths and lengthwise into fourths. 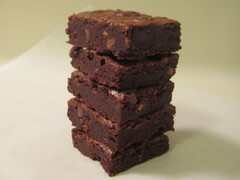 (In other words, cut the brownie slab into 20 pieces.) Wipe the blade with a damp cloth between cuts. Maybe we, your loyal readers, should organize a food-run to deliver sugar, flour, chocolate, cream, milk, nuts etc to you to keep you blogging! cut into 20, and omitting the nuts, these look like 2 points each to me. whoohoo! they sound delish. Looks delicious! I also have no willpower and stuff my coworkers faces with dessert when I bake! Good luck with the weight loss! I am hoping to do the same once my crazy semester ends, so the low cal desserts are much appreciated! Those are definitely tasty looking! It’s always nice seeing a tasty treat that isn’t 500+ calories (though those have their place too… usually in somebody else’s stomach!). I’m back on WW too, now that Passover is over and these look really good! I think the key for me will be to cut them up right away and individually wrap and freeze each brownie. Hope to try these in the next couple of weeks! Thank you!